HOW DO YOU FIND SOMEONE WHO DOESN’T EXIST? There’s no such person as sic_girl. She’s a fake internet personality that programmer Dani Farr designed to win a bet. But she’s just started spilling state secrets. Dani can’t imagine why anyone would hack a bit of code she created as a joke… but sic_girl has Dani in her sights, and now she risks losing everyone and everything she cares about. Government minister Bethany Lehrer has put her job on the line to launch Digital Citizen, a national online ID scheme. sic_girl seems determined to bring that down. And if Dani and Bethany don’t figure out who – or what – is behind sic_girl, it won’t just be their lives and privacy at stake. Because the more secrets sic_girl spills, the clearer it becomes: Nothing is private. No one is safe. Sockpuppet is part of the Martingale cycle. Audible invited me into their studios to talk about the inspirations and ideas behind Sockpuppet. You can listen to the full interview here. 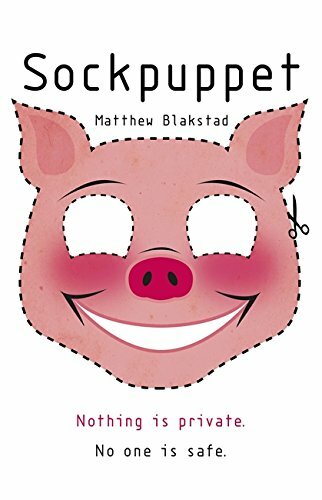 Sockpuppet is available in paperback, hardback, ebook and audiobook. Buy it using the link below – or ask for it at your local independent bookseller.